Vedantu.com - No.1 online tutoring company in India provides you Free PDF download of NCERT Solutions for Class 12 Biology Chapter 10 - Microbes in Human Welfare solved by Expert Teachers as per NCERT (CBSE) Book guidelines. 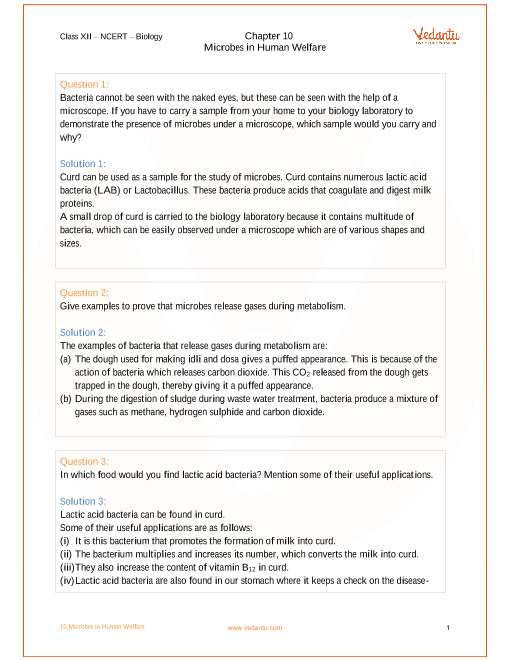 All Chapter 10 - Microbes in Human Welfare Exercise Questions with Solutions to help you to revise complete Syllabus and Score More marks. Register for online coaching for AIPMT(NEET), Engineering and Medical entrance exams. NCERT Grade 12 Biology Chapter 10, Microbes in Human Welfare is from the Unit, Biology in Human Welfare. Students have learnt that microbes cause a large number of diseases in human beings. They also cause diseases in animals and plants. But this should not make you think that all microbes are harmful; several microbes are useful to man in diverse ways. Some of the most important contributions of microbes to human welfare are discussed in this chapter. Microbes in Household Products, Microbes in Industrial Products, Microbes in Sewage Treatment, Microbes in Production of Biogas, Microbes as Biocontrol Agents and Microbes as Biofertilisers are the main topics discussed in this chapter.Similarly, Fermented Beverages, Antibiotics, Chemicals, Enzymes and other Bioactive Molecules are the detailed sub-topics in this chapter. Diagrams, illustrations, figures and lucid language make this chapter comprehensive and easy to learn. Sequential progress of topics helps to grasp and retain better.Technical terms associated to Microbes in Human Welfare; and summarizing points are some aspects of NCERT Grade 12 Biology Chapter 10, Microbes in Human Welfare that make it interesting and fun to learn. NCERT Grade 12 Biology Chapter 10, Microbes in Human Welfare is from the Unit, Biology in Human Welfare. A combination of 3 chapters, this unit holds a total weightage of 14 marks in Grade 12 final examination. Get 100 percent accurate NCERT Solutions for Class 12 Biology Chapter 10 (Microbes in Human Welfare) solved by expert Biology teachers. 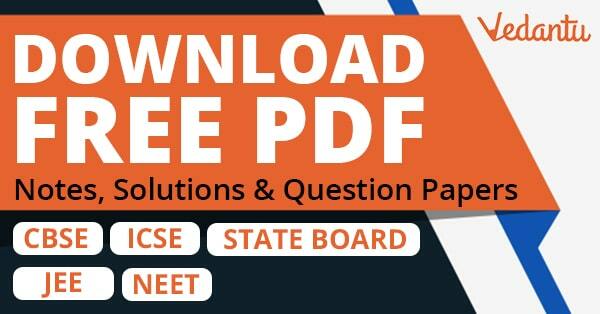 We provide solutions for questions given in Class 12 Biology text-book as per CBSE Board guidelines from the latest NCERT book for Class 12 Biology. The topics and sub-topics in Chapter 10 Microbes in Human Welfare are given below. Ex 10.6 - Microbes as Biofertilisers. Chapter 10 Exercises - 15 Questions with Solutions. Other than given exercises, you should also practice all the solved examples given in the book to clear your concepts on Microbes in Human Welfare. Download the free PDF of Chapter 10 Microbes in Human Welfare and take the print out to keep it handy for your exam preparation.